Another strike against Piketty: No price like home | No Rent Grabbing! Another strike against the argument of Piketty: In a recent paper, launched by Knoll, Schularick and Steger (2014), a different channel of redistribution of wealth has been stressed. The article is tied to the work of Bonnet et al. (2014), who have shown that the late 20th century surge in wealth-to-income ratios in Western economies is largely due to increasing housing wealth. Moreover, in a recent study, also Rognlie (2015) established that (net) capital income shares increased only in the housing sector while remaining constant in others sectors of the economy. In contrast to Piketty (2014), the authors show that higher land prices can push up wealth-to income ratios even if the capital-to-income ratio stays constant. The critical importance of land prices for the trajectory of wealth-to-income ratios evokes Ricardo’s famous principle of scarcity: Ricardo (1817) argued that, over the long run, economic growth profits landlords disproportionately, as the owners of the fixed factor. Since land is unequally distributed across the population, Ricardo reasoned that market economies would produce rising inequality. The paper of Knoll, Schularick and Steger (2014) traces the surge in housing wealth in the second half of the 20th century back to land price appreciation. The paper presents annual house prices for 14 advanced economies since 1870. Based on extensive data collection, they show that real house prices stayed constant from the 19th to the mid-20th century, but rose strongly during the second half of the 20th century. Land prices, not replacement costs, are the key to understanding the trajectory of house prices. Rising land prices explain about 80 percent of the global house price boom that has taken place since World War II. Higher land values have pushed up wealth-to-income ratios in recent decades. Bonnet, O., P.-H. Bono, G. Chapelle, and E. Wasmer (2014): Does Housing Capital Contribute to Inequality? A Comment on Thomas Piketty’s Capital in the 21st Century, Science Po Department of Economics Discussion Paper. 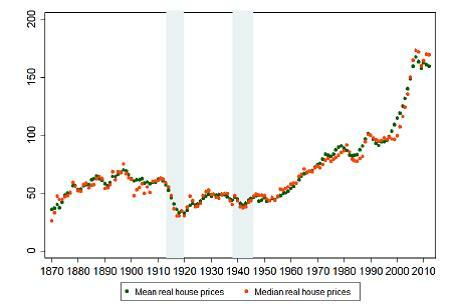 Knoll, K. / Schularick M. / Steger, T. (2014): No Price Like Home: Global House Prices, 1870 – 2012, CESifo Working Paper No. 5006. Piketty, T. (2014): Capital in the Twenty-First Century, Cambridge: Harvard University Press. Ricardo, D. (1817): Principles of Political Economy and Taxation. Rognlie, M. (2015): Deciphering the Fall and Rise in the Net Capital Share, Brookings Papers on Economic Activity. It is correct that urban land prices are the explanation for inequality in our time, rather than returns to productive capital, but what is being tragically missed by most analysts, is the role played by regulatory interferences in the conversion of land between uses, i.e. from rural use to urban use. I make another critical comment on another paper touching the same issues, Jorda, Taylor and Schularick’s slightly later working paper, “Betting the House”. Seems like an oversimplified rebuttal. Why has Piketty missed this in his big book? Henry George had a lot to say over a century ago, about the tendency for certain political activists inability to distinguish between the harm done by zero-sum rentiers in land and finance, versus those who become wealthy by actually creating value in response to market demand. The Left has for decades gone after “the employer” while completely ignoring the mutual enemy of both Labour and Productive Capital. The UK is a classic case: because of the 1947 Town and Country Planning Act, the cost of urban land has risen by a factor of some tens of times or even hundreds of times (relative to benchmark US cities with no growth constraints). But almost no-one on the mainstream Left – in Parliament or media or activism – has anything to say about this. The AudaCity organisation is an honourable exception but they are not mainstream. Piketty is possibly just another leftist whose ideological blinkers cause him to make yet another “case against the 1 percent” without any distinction between value creators and rentiers. Of course in the case of housing, there are a lot more gainers than just one-percenters – all home owners “gain” and become a constituency against reform. But the big property investors and mortgage financiers definitely make the bulk of the killing. Why is there Soros and Rockefeller money in urban planning policy advocacy?